Covered call writing dilemmas can frequently result from positive circumstances. In August 2017, Vincent shared a trade he executed where an out-of-the-money strike was sold and share price had moved up significantly and was approaching the strike price. This means that Vincent realized an initial option premium return plus had an unrealized share appreciation component to this yet unsettled trade. Since the trade had nearly reached its maximum return, Vincent was considering closing the short call and either selling the stock or rolling out to a latter expiration date. Let’s explore, which action, if any, should be considered. The red arrows and green circle highlight a bullish and confirming technical chart pattern. In a neutral to bullish overall market environment, out-of-the-money strikes are most appropriate when also associated with chart patterns like this one. Let’s assume we are fearful of the overall market. Choice (a) can be considered. Keep in mind that we are spending 4.4% of our initial investment to close. However, that will still leave us with a 2.7%, 1-week return…not so bad. To consider this, our bullish assessment must have turned around 180 degrees in the past week. I’ll group these last 2 considerations together. Both involve rolling to the December calls. The attraction to each are the juicy premiums. Don’t be enticed. They will bring you through the next earnings release, breaking one of our BCI rules. Also, we will generate greater annualized returns using Monthlys rather than longer-term options. Finally, we also will have more opportunities to re-assess our bullish assumptions with shorter-term options. Although I never give specific financial advice in this venue, I can comfortably tell you that I would not consider (b) and (c) leaving your decision to either take no action or close at the 2.7%, 1-week profit depending on your current overall market and stock assessment. Taking no action is therefore a 4th consideration. “The 3-day forum, held annually in the spring, gathers some of the most successful people in finance together to share their knowledge, expertise and outlook for the future with graduate and undergraduate students”. BCI: Initiating a more bullish stance on trades moving forward as the market has strengthened and volatility has substantially subsided. Still cautious selling 3 out-of-the-money strikes for every 2 in-the-money strikes. The 6-month charts point to a neutral to slightly bullish outlook. In the past six months, the S&P 500 was up 17% while the VIX (14.64) moved up by 55% but trending down. I have a question for you. I’ve been an active investor (stocks, mutual funds, precious metals, option spreads) since the mid 80s. Like yourself, I’ve been through some bear markets, and in 2008-9 was able to limit my losses to about 15-20%. My question is: when using your (excellent) strategies, what do you have in place to protect yourself from the next inevitable correction, which could very well be even more severe that 10 years ago? One of the advantages of short-term option-selling is that we can re-evaluate our overall market assessment on a weekly or monthly basis. Should the US economy, global economy and favorable corporate earnings growth turn bearish, it will be a gradual process. We can adjust our positions accordingly by favoring in-the-money strikes, entering our covered call trades by first selling out-of-the-money puts, using lower volatility underlyings, considering more conservative ETFs, lowering our time value return goals to lower the implied volatility of our option selections and more. Should another aberration take place as it did in 2008, we must be prepared to move into cash,. if necessary (inverse ETFs can also be used). Since this doesn’t appear to be on the horizon right now, let’s enjoy the ride. I am wondering if you have a guideline on what percent of a total portfolio should be earmarked for Covered Call writing? I realize each person’s situation is unique and I’m not looking for specific investment advice but rather some thoughts on how to approach this question. Now that I have become more immersed in the BCI methodology, it seems like the a significant portion of a portfolio could comfortably be dedicated to this strategy. Alan will give you a comprehensive and thoughtful reply as he does with all questions here. But I can share my experiences – I wrestle with this question all the time! I have come to view cc’s as defensive in nature. So I write more when on the fence or bearish and fewer when bullish. Others simply flex their strike selection and go on covering entire portfolios every month. I look at it position by position and never cover 100% of any position at any one time to give it upside breathing room. It if I really like a position’s chances that month I don’t cover it at all. A more systematic way to “back into” what % of your portfolio you over write is to set a monthly target for how much premium you want to receive. Never confuse premium with income! it may all be income at the end of the month or it may all be loss protection and your account balance be down. Similar to dividends. It usually ends up somewhere in between. But let’s say your target is $5000 and you are choosing strikes on your stocks that will give you 2% monthly ROO. That will take a commitment of $250K to the strategy each month and that will be whatever % of your portfolio that is. you explanation is perfect, and certainly helps us with our permanent doubts. I would like to add, that when I first chose to follow Alan’s methodology, I had the same doubts about his recommendation to be fully invested. Now, after a few years of using it, I see the advantage of being fully invested at all times, except when an extremely dangerous event comes up, like the recent “Brexit”. Obviously my total portfolio is only a relatively small part of my total net worth. 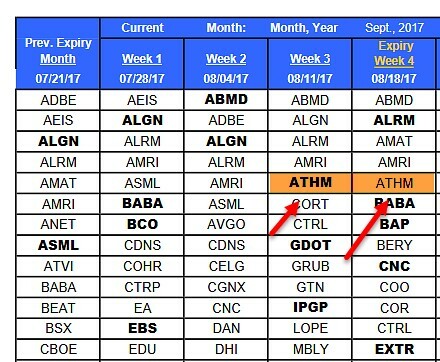 When you are fully invested each month, (avoiding ERs), you can maximize your average annual income, because there are 4 ER seasons where most of the best tickers are unavailable for CC writing. It’s funny, when I was working I was always fully invested. I was too busy for trading so I just maxed out my 401K and swept any cash left over each month into a mutual fund, I only looked at the statements at tax time! A quick follow up I left out of my reply: you mention 4 ER seasons and tickers not available. I know you work this and keep score monthly expiry to expiry so you can stay fully invested moving to things that do not report that new month. But some who hold stocks a longer time and still over write them can switch to the weekly, if available, and keep it to 4 weeks, not months, a year uncovered. Some long term stock holders actually do that 8 weeks a year to hop scotch around both earnings and ex div dates. I do look at weeklies, and sometimes roll out when there are 10 or more days left between expiry and ER date, especially when I have used the 20/10 rule, and I’m holding the stock and it seems to be recovering. But most of the time, OI on weeklies is too low, and bid/ask spreads are large, while premiums are mostly lower. I do like to make at least near 2% ROO on my invested cash, independent from the time frame. Another thought about the official expiry Friday, is that it is easier to manage the positions, (as Alan always says) when they all expire on the same date. Much of our decisions regarding our portfolio mix is based on personal risk-tolerance and experiences with various investing approaches. 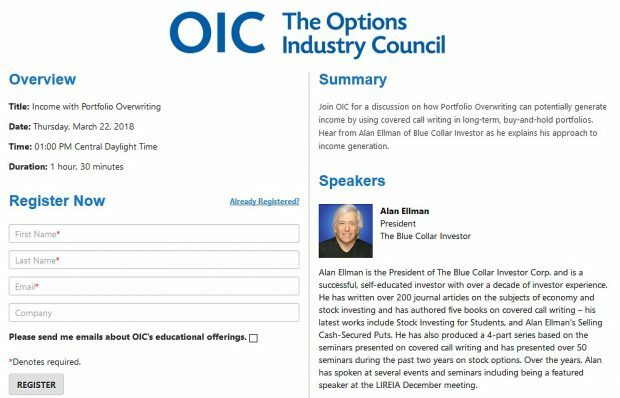 There is no right or wrong here but I’m happy to share with you my involvement with option-selling. In the stock portion of my portfolio, I have dedicated about 90% of available cash. 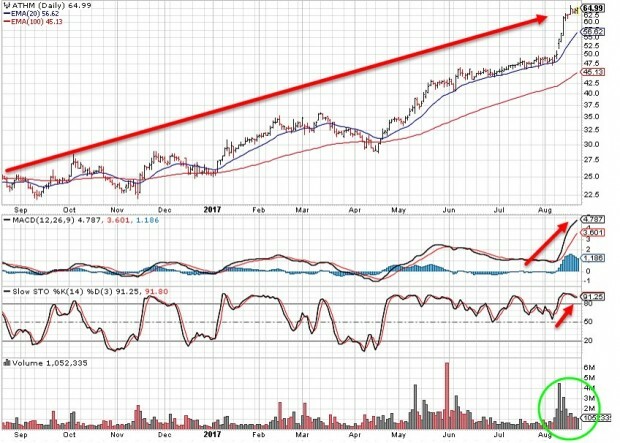 The remaining 10% (stock portion of my portfolio only) is in longer-term holdings (mainly tech companies). I also have a significant portion of my investment portfolio in real-estate, fixed income and cash-equivalents. I strongly believe in asset allocation but in the stock portion of this portfolio, covered call writing dominates. Thank you so much for sharing your perspective on my question. This week’s Weekly Stock Screen And Watch List has been uploaded to The Blue Collar Investor premium member site and is available for download in the “Reports” section. Look for the report dated 03/09/18. I wanted to execute a MCU on MA and entered a Buy-Write order for a net credit that was a 25 cent time value for the option. I was not getting filled even though I could see that the prices were trading at or below my limit. Finally I switched to a market order and immediately was filled at a 23 cent time value which was lower than my limit. What are the thoughts on why the limit was not executed? I have come up with your situation now and then. I have 5 different account with Fidelity and Etrade, 4 of which i usually trade the same CC position. I have 4 identical limit orders when I play the spread. After my initial limits in my favor, I then play the spread with just one account till I get a filled order. Then I go to the other 3 accounts and set the new limit which fills. Now and then I find a particular limit that does not fill on a position. I then change the limit a value in my favor, and go back to the desired limit. It fills then. I sometimes say it happens to be coincidence that it filled when going back to the original value, just did not wait long enough. But that has happened repeatedly. Maybe you tickle the computers or the market makers just right when you make a change to an existing order. Another situation I sometimes get, but rarely, is a difference between the two brokerages on the midpoint limit of a debit order or credit order. That is frustrating. I exit the platform and restart but problem repeats. I have no explanation for that also. Maybe some of our pros can explain these events. I’m curious if this occurred during early morning or late afternoon trading hours when computerized institutional trading frequently increases market volatility and pricing tends to whipsaw more so than other trading hours? For this reason, I tend to execute my trades between the hours of 11 AM and 3 PM ET excluding exit strategy opportunities. This was late afternoon, so you may be onto something with the increased market volatility trading. I had not considered that. Regarding Vincent’s trade for this blog article, I would keep the trade with no action for now until the Cost to close (MCU Unwind) is around 0.1% of the return cost basis (61.95). The 0.1% means I would wait till the BTC is $0.06. That an unwind loss of $6.00 with a combination limit order for a 1 contract trade. Or $16.00 if there is a $10 commission for 100 shares to close both legs. If you close now (MCU unwind) with a BTC of 7.70 you lose 4.3% which give you a net gain of 2.7% ($167.26), as you say in the article. Compared to $426.00, $167.26 is a lot to throw away, unless one is really bearish for the future for this position. Thank you for your education on call writing but I’m wondering if this can work with a small account. $10k to be exact. With a portfolio net worth of $10k, covered call writing can be used with ETFs so that adequate diversification can be achieved. Once portfolio value is enhanced to the $25k – $35k, we can then move to individual stocks. My opinion is with a $10K portfolio you should first feel good about accumulating it! But do not bother with covered calls yet. Instead look at funds in the technology area for growth and build a larger base. Also please find a program that allows you to paper trade covered calls first. CC’s are wonderful but they are not without frustrations. You need to understand that first. I was wondering what your opinion is regarding covered call writing in a taxable account. I understand that the tax hit is significant but access to capital is also greater than in a tax sheltered account. I appreciate your input. Check with your tax advisor before making any tax-related investment decisions. In general, option-selling results in short-term capital gains (losses). Therefore, favoring sheltered accounts makes sense when possible. If not, taxable accounts are appropriate. An attorney/CPA friend of mine was stated that he would love to pay $1 million in taxes one year. I believe that impressive returns can be generated with both Weeklys and Monthlys although I favor the latter. Weeklys are especially useful in circumnavigating around earnings report and ex-dividend dates and may also result in higher annualized returns…maybe. Let me re-emphasize that we can be successful with both Weeklys and Monthlys once we’ve mastered the 3 required skills. Option-selling results in short-term capital gains (losses) and that is why trading in sheltered accounts is preferable when possible. Since I am not a tax expert, I would refer other tax-related questions to your tax advisor.